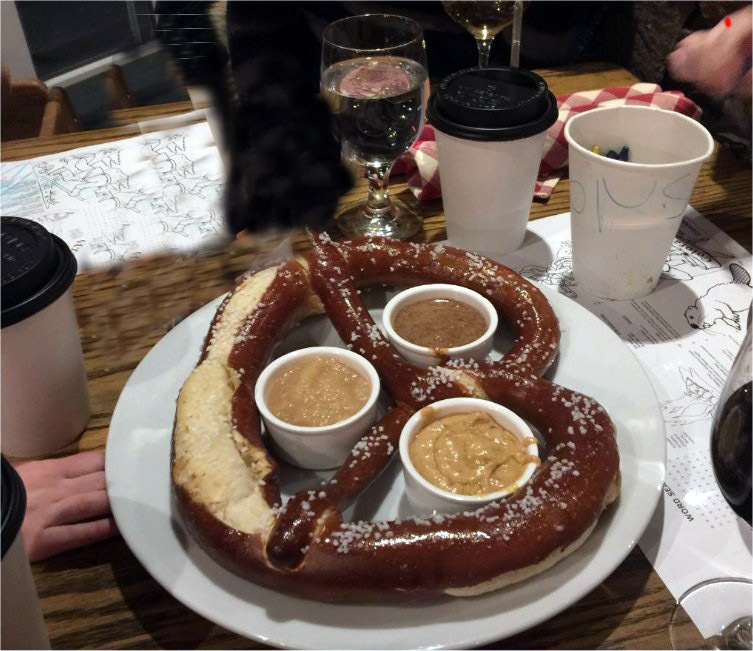 On 2/2/2017 Katherine Chung and me (Brian Wilson) went to Vail to show Katherine "Plastic Bavaria" for the first time and so I could go skiing. Click on any picture of the largest "original" that I have. First, some movies! 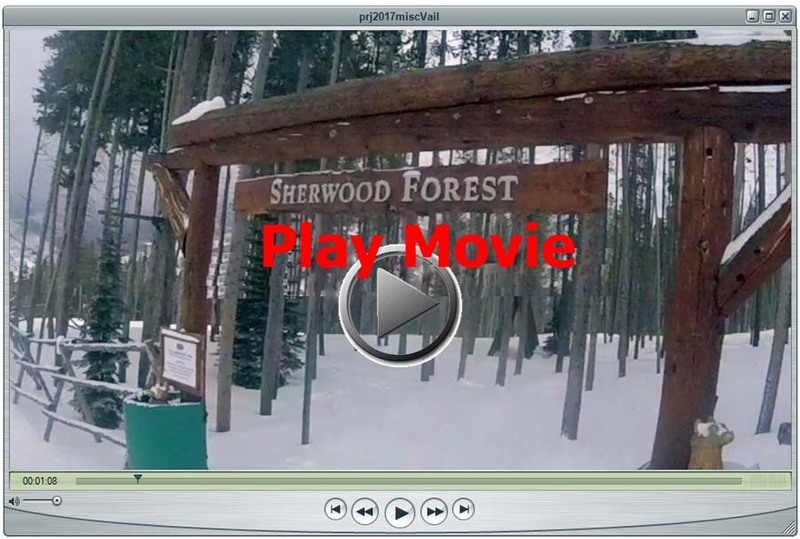 The first one is a 2 minute video of a continuous ski run from Two Elk (at the top of Vail) down to Vail Village. Click here for the highest quality original. A 5 second video of the Vail employees who hand out tissues when you walk into "Two Elk Lodge" at the top of Vail mountain. Highest quality original here. A video of me goofing around in the trees. Click here for the highest quality version. Arriving in the Denver Airport, "Welcome to Denver". 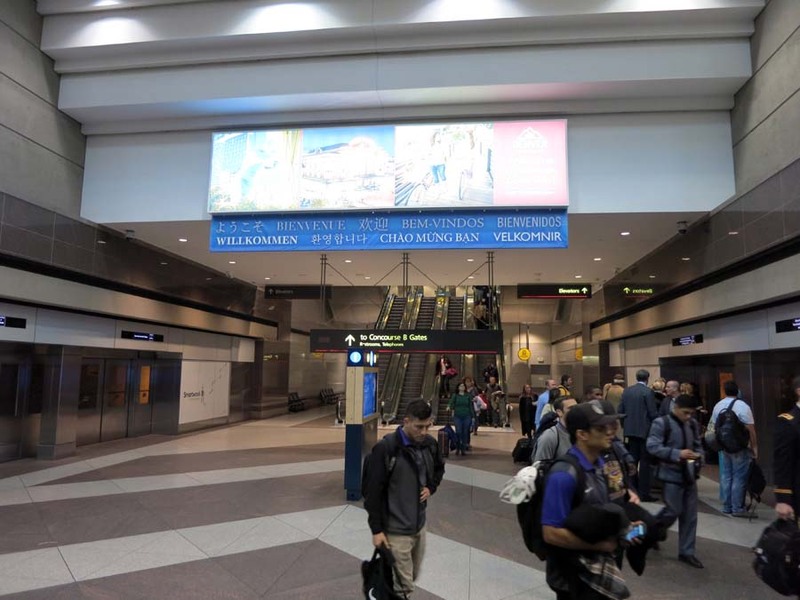 This is the underground train between terminals. 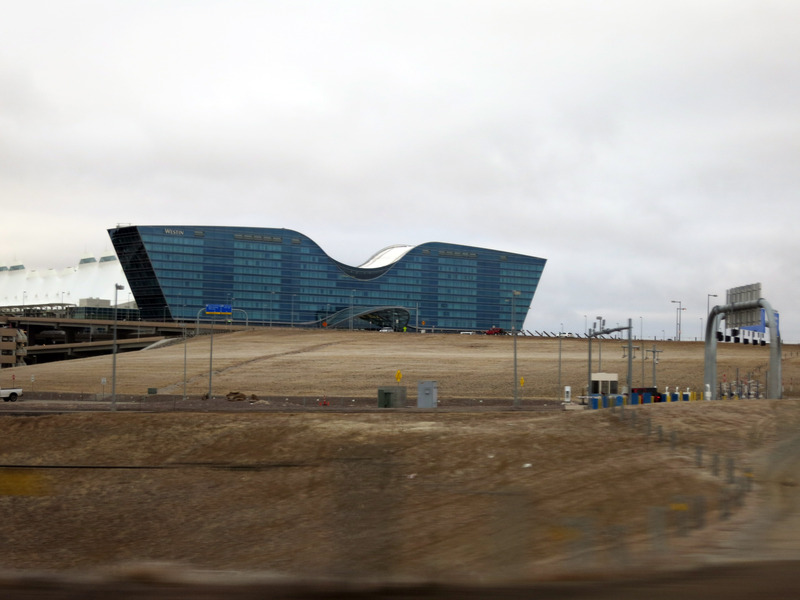 At the Denver airport, they added a MASSIVE hotel to the side of the main terminal. It is a "Westin Airport Denver" and is crazy building seen below. 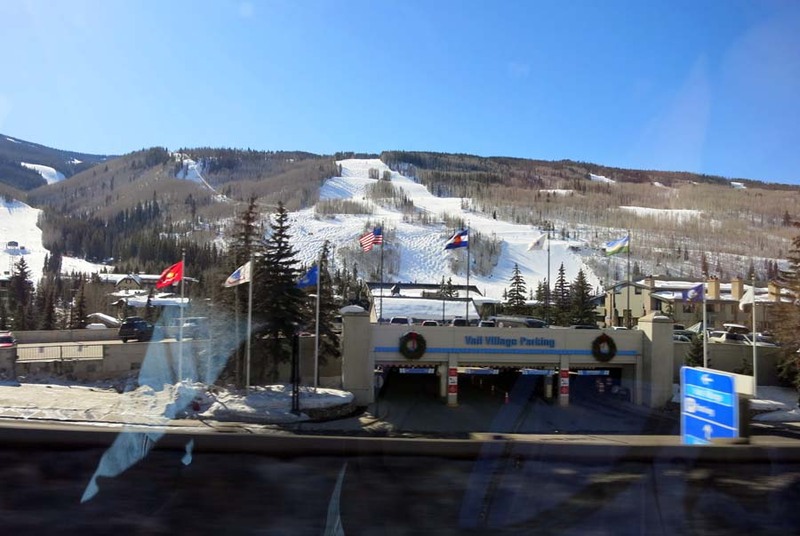 We took a limo of "Mountain Star Transportation" from the Denver airport to the Vail resort. The drive takes about two hours on reasonable road conditions. 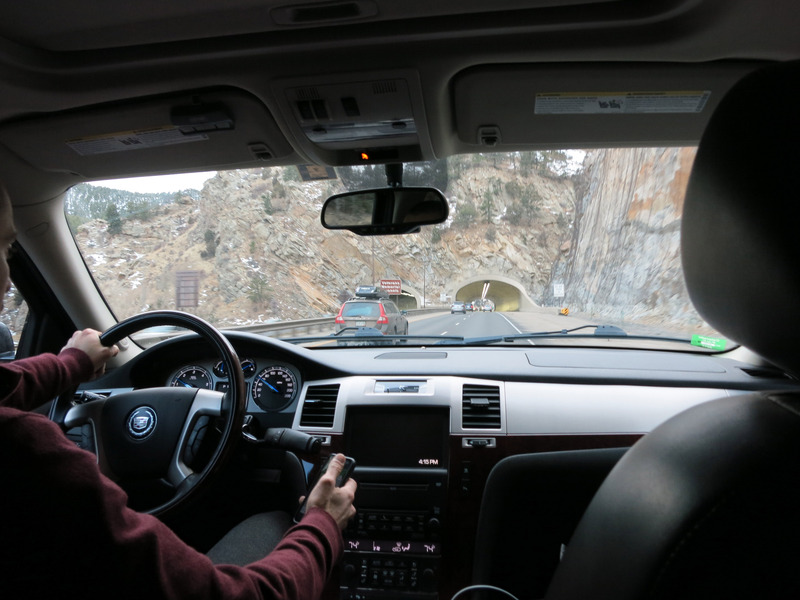 The car was an Escalade SUV which seems kind of overkill for two of us. 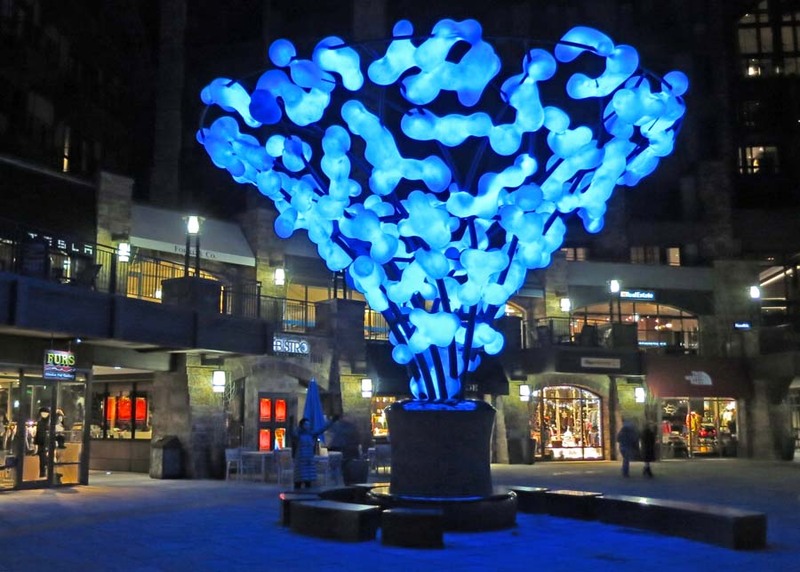 Later that night on the way home, one particular light statue at night in the town of Vail, Colorado. Katherine is standing with open arms at the botttom. The next morning Katherine slept in and I went skiing! 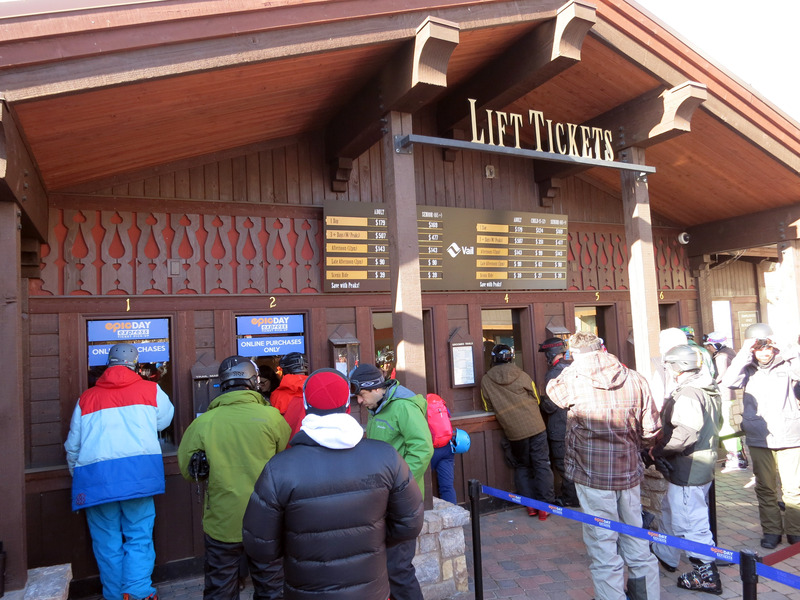 I had bought my lift ticket in advance from home, but had to pick it up (electronic badge) below in the "express" line. You can see the prices, which is 1 adult all day for $179. Wow. 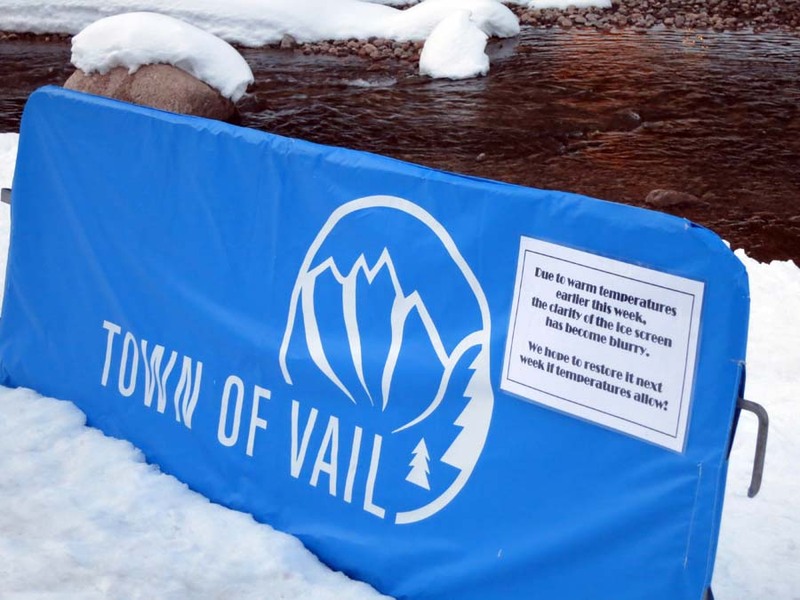 Vail tries to maintain the very most expensive lift ticket in all of the world. 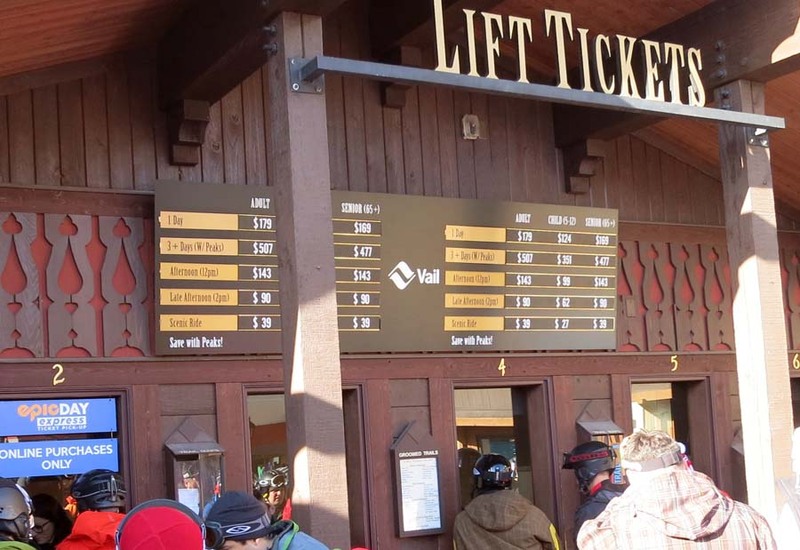 I think the first time I ever spent more than $100 on a lift ticket was at Vail in 2006. 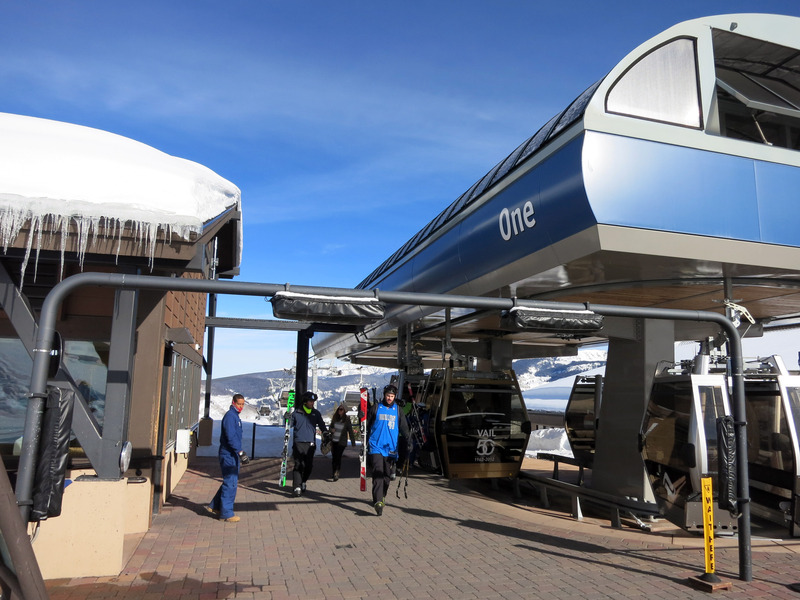 The top of Gondola "One" at Vail before I ever clipped into skis. The weather is outstanding. 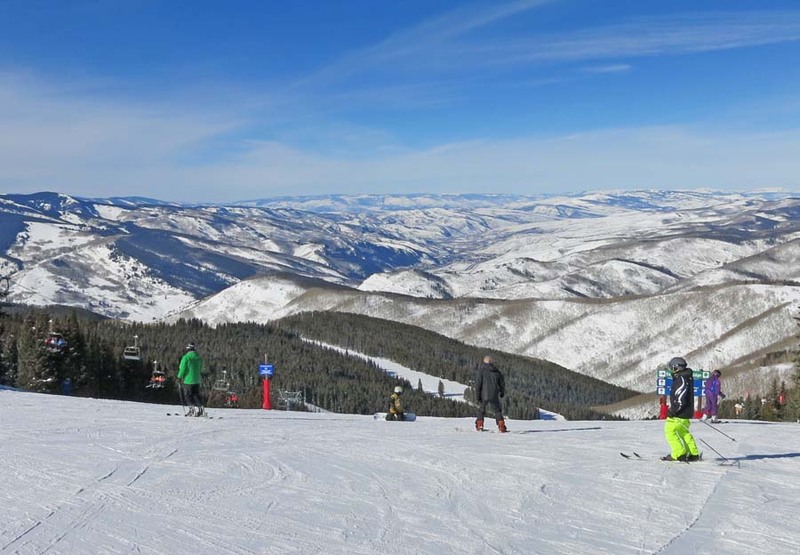 This is the top of Gondola One at Vail, also known as "mid-Vail". It is a beautiful day, and the snow was actually quite nice (I had been worried it would be too warm and the snow would be bad). A panorama taken near the top of Game Creek Express at Vail. 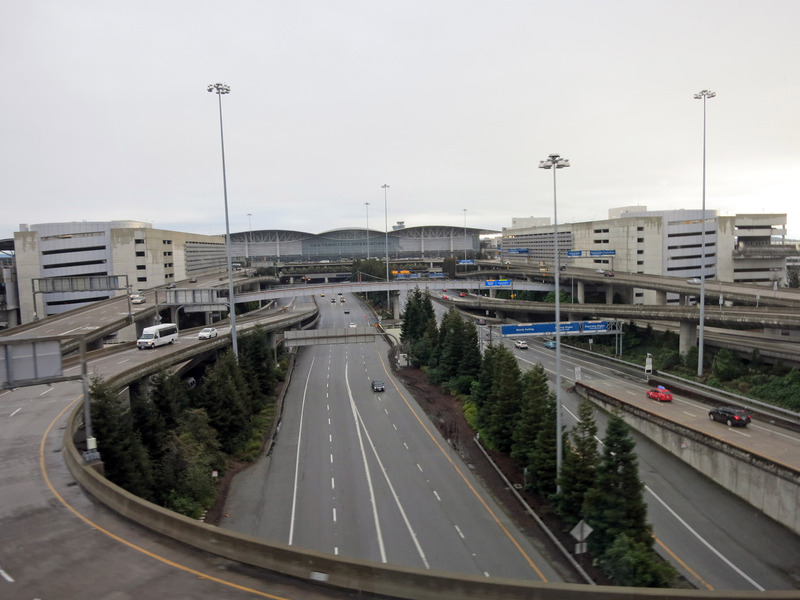 Use the horizontal scroll bar to see more to the right. 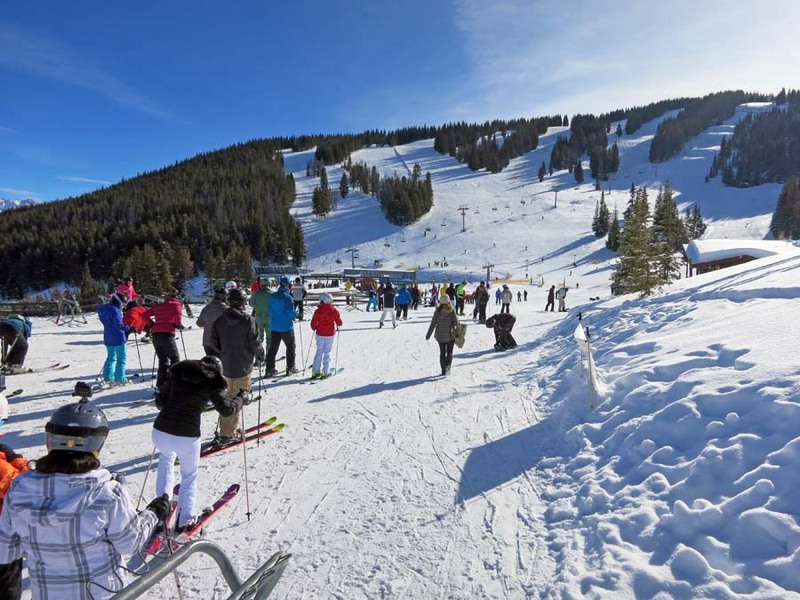 Lots of sunshine at Vail ski resort. Beautiful views. A view of Vail Village from the lower ski slopes. 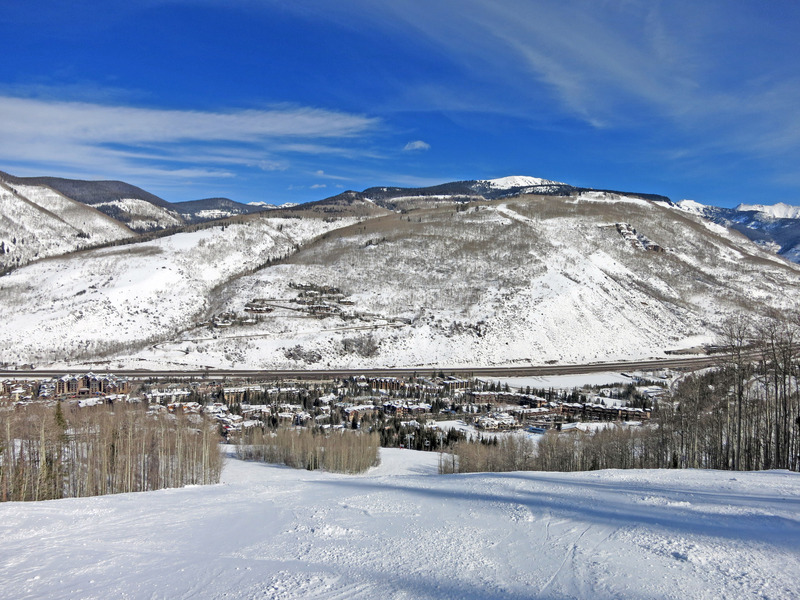 A panorama of Vail Village from the ski slopes. Use your horizontal scroll bar to view more to the right. A final picture of Vail Village in the sunshine. 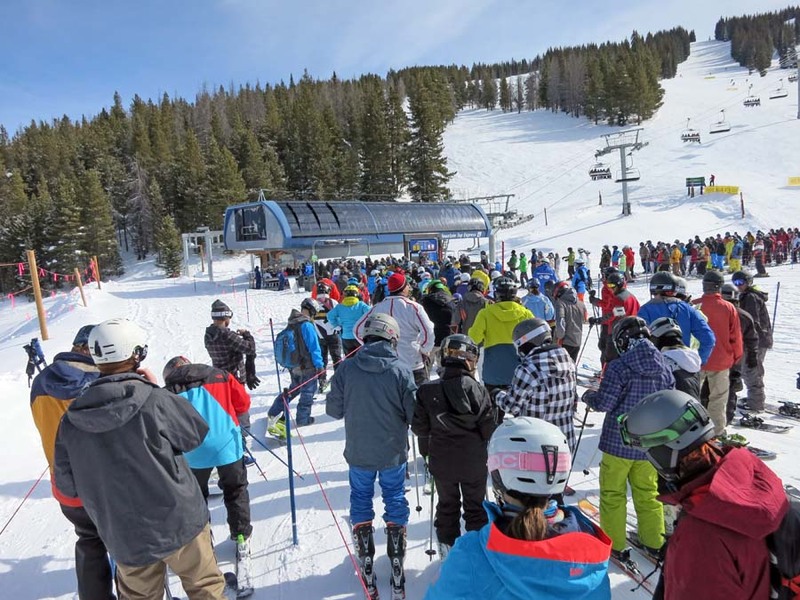 In the middle of the day, the lines got "pretty long" by Vail standards which were about 10 minute lift lines. 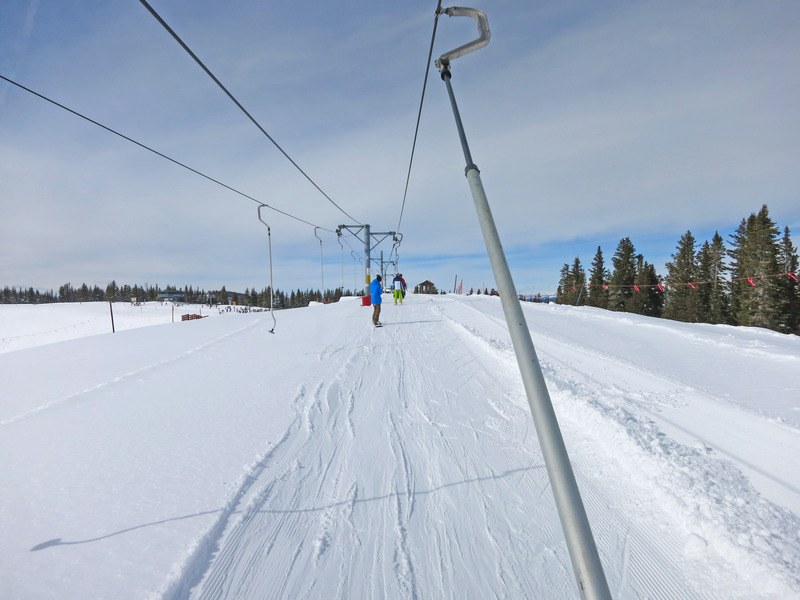 The lift pictured below is a high speed 6 pack that really scoops and moves people up the hill. 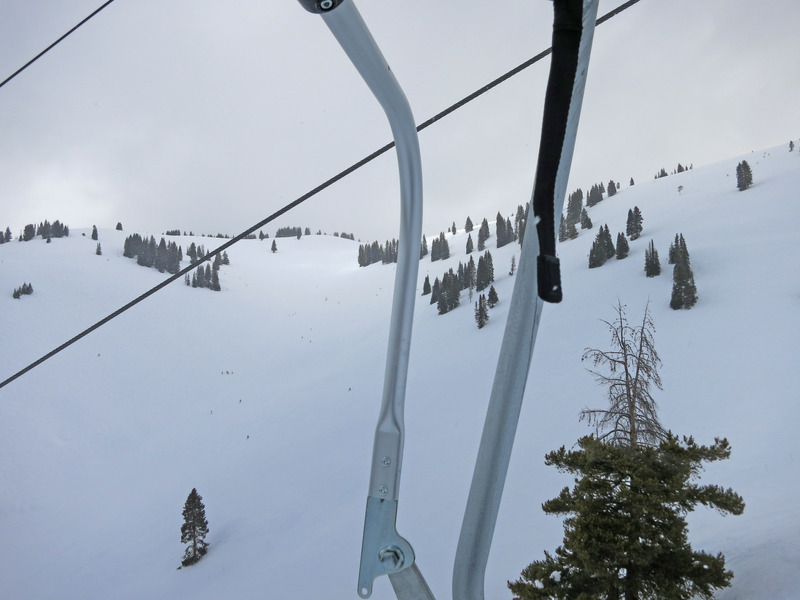 Another picture of the lift line. 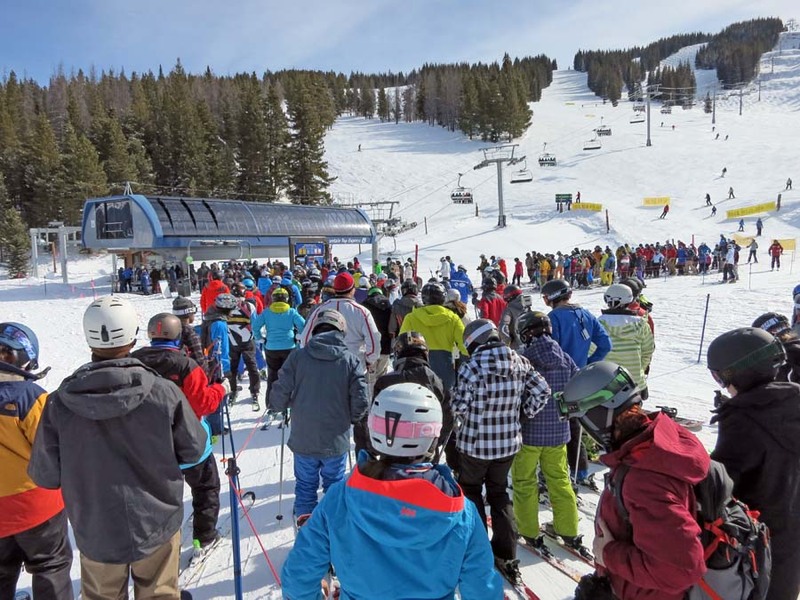 I want to point out about 99.9% of people are wearing ski helmets (I do not own one). 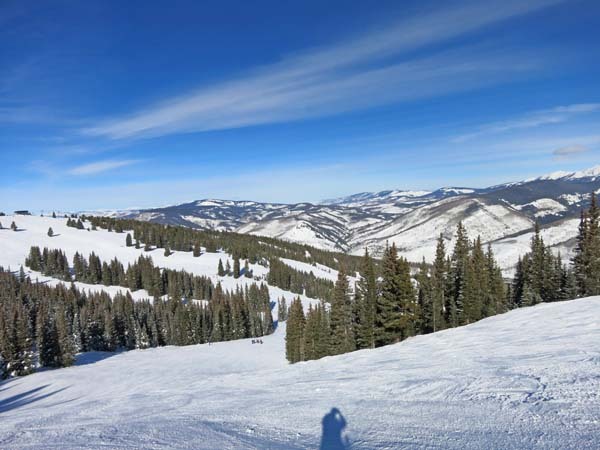 The percentage wearing helmets has been increasing every year for the last 20 years since I wrote this blog post about ski helmets. 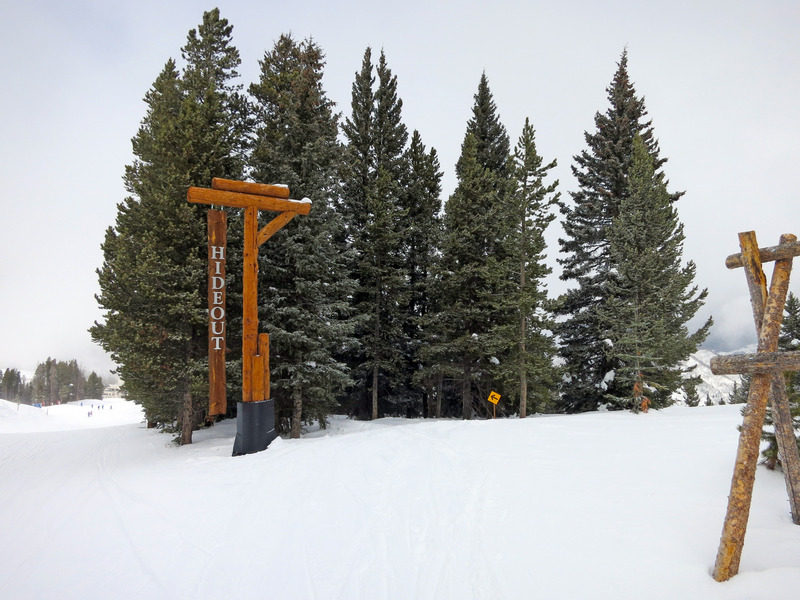 There is a short "Poma lift" near Two Elk restaurant at the Vail ski area. You need it to go across a flat area if you are on the other side. I rode this 10 years ago also. 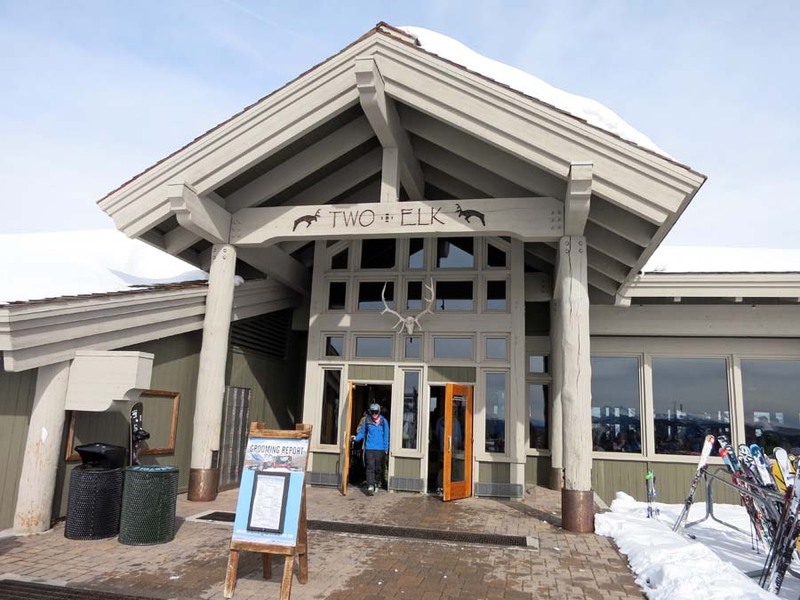 Two Elk Lodge (mostly a restaurant) at the very top of Vail ski resort. I stopped for a break and to eat lunch here. 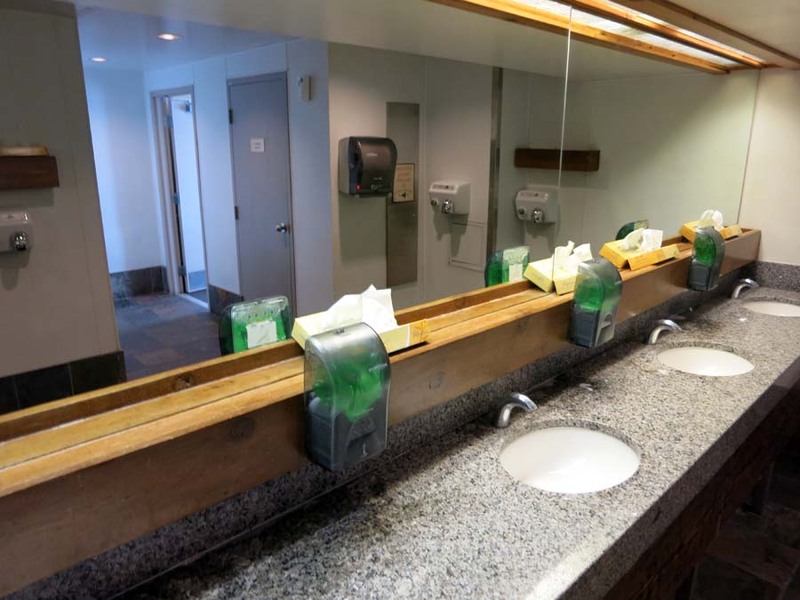 As you walk into Two Elk, Vail employees hand you tissue to wipe your lenses and blow your nose. This is a repeat from the very top of this page: a 5 second video of the Vail employees who hand out tissues when you walk into "Two Elk Lodge" at the top of Vail mountain. Highest quality original here. 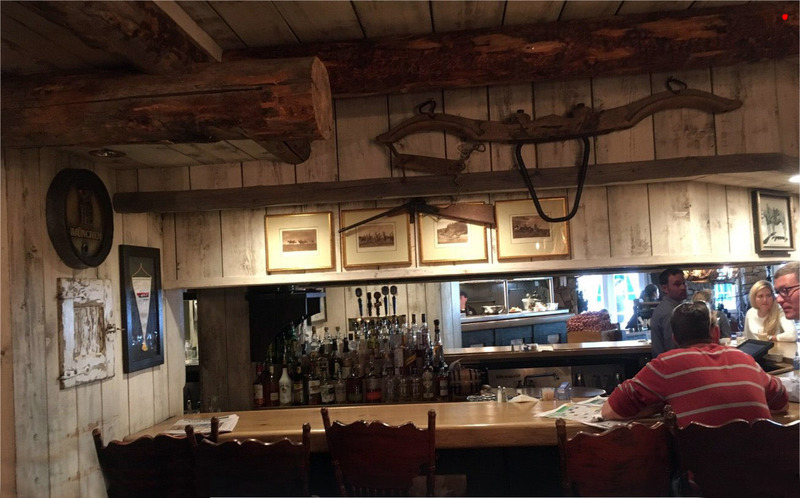 Below is a panorama of the inside of Two Elk. It is a little blurry and washed out, I think my camera lens was fogging up. 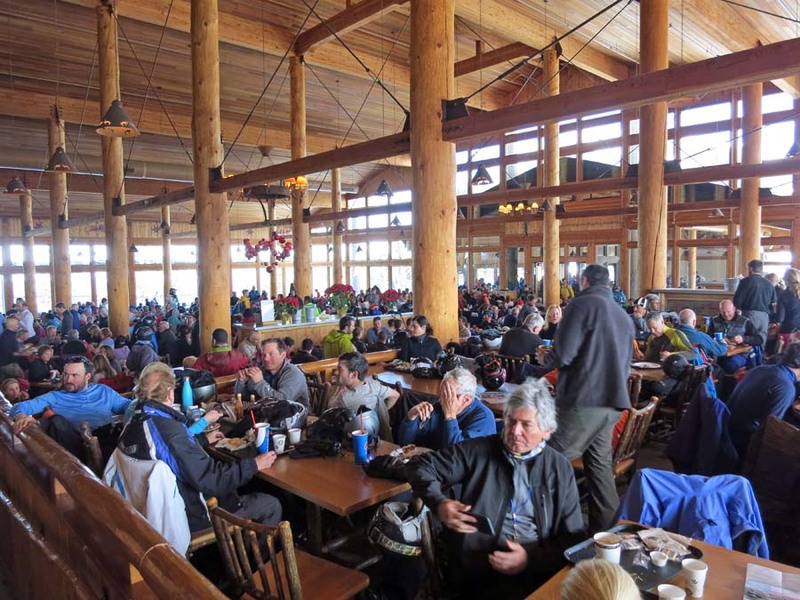 Two Elk Lodge is very crowded from 11:30am - 1:30pm with the lunch crowd. 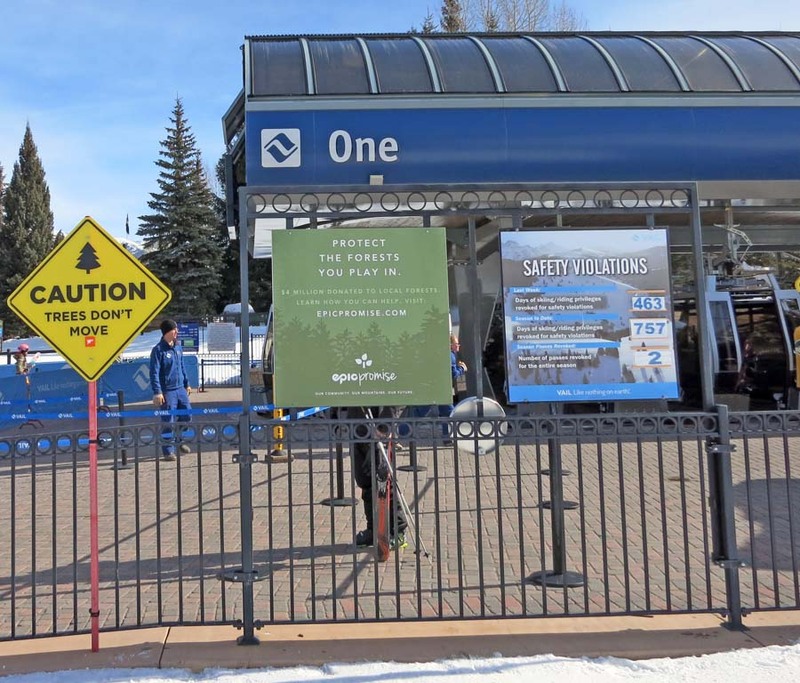 Vail really takes the whole ski experience seriously, down to the last details. In every bathroom stall there are baskets for your gloves and goggles. Why? 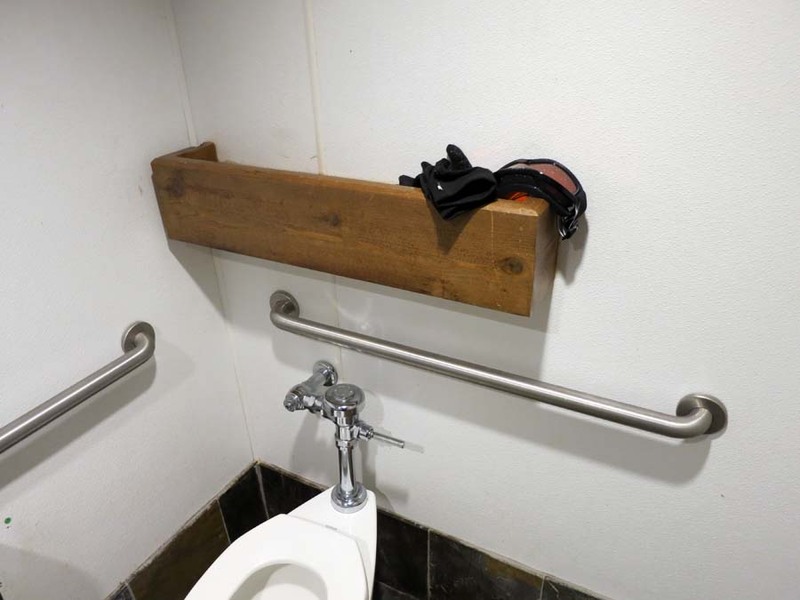 Because ***EVERY*** skier has to take off their gloves and goggles while the use the toilets, and it is nice to have somewhere to set these down not on the floor. 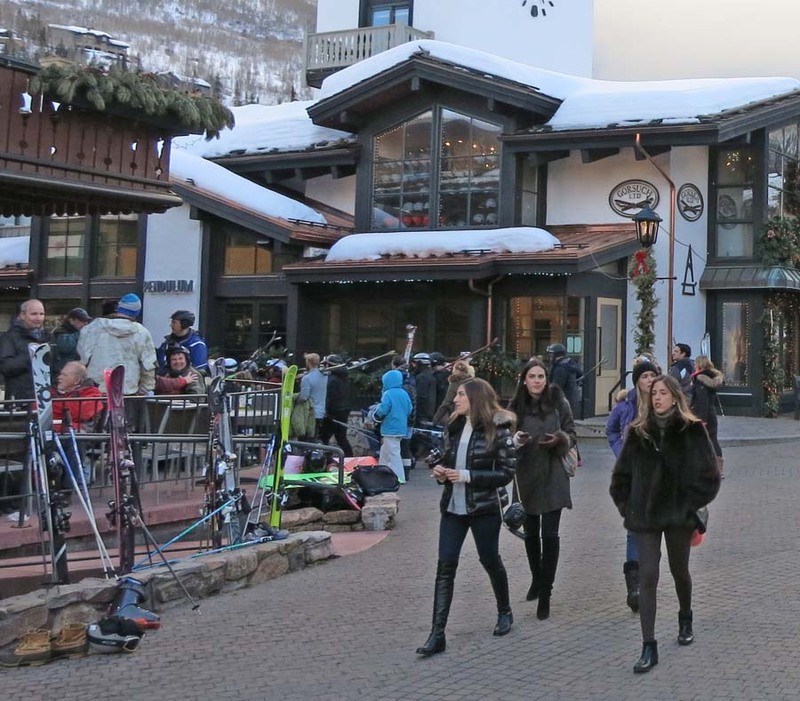 This may seem obvious, but more than half of all ski resorts do not have baskets. Below are the nice wooden baskets in the Two Elk bathroom. Same with when you wash your hands, notice there are tissue and a "basket area" to place gloves and keep them away from the water and floor. And those are marble countertops in a ski area bathroom. 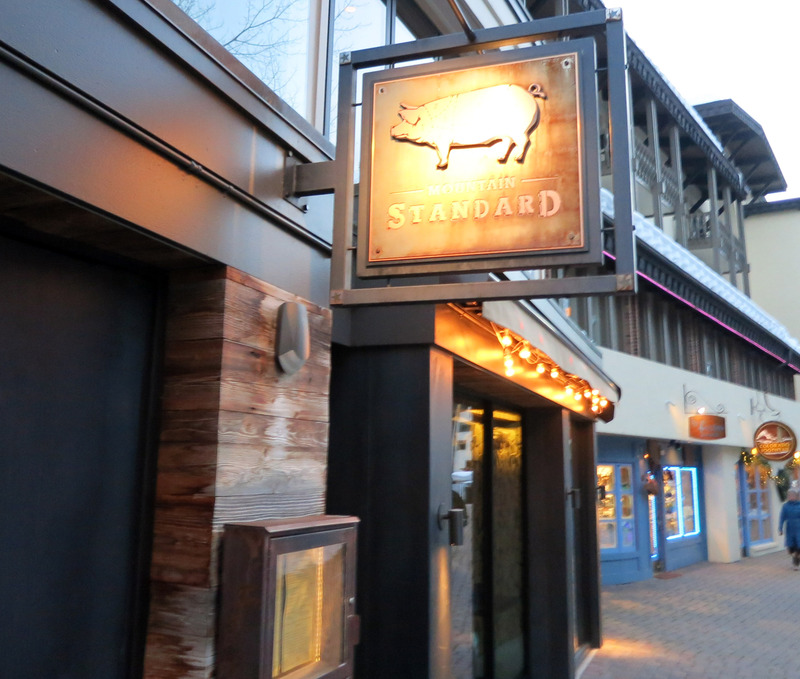 Vail is bone crushing expensive, but they do a great job at virtually every detail. I like these little areas marked "Hideout" with the yellow arrow sign pointing into the trees. It will be a "gladed tree ski area" where you can play in the trees. The second night (Friday night) Katherine and I tried to have dinner at "Sweet Basil" but they weren't open until later, so Katherine and I ate at "Mountain Standard" which is Sweet Basil's sister restaurant. It is "hip" right now in Vail Village. We enjoyed it, it was pretty good. There were some half melted ice seat sculptures across from Moutain Standard restaurant so I took Katherine's picture in one. 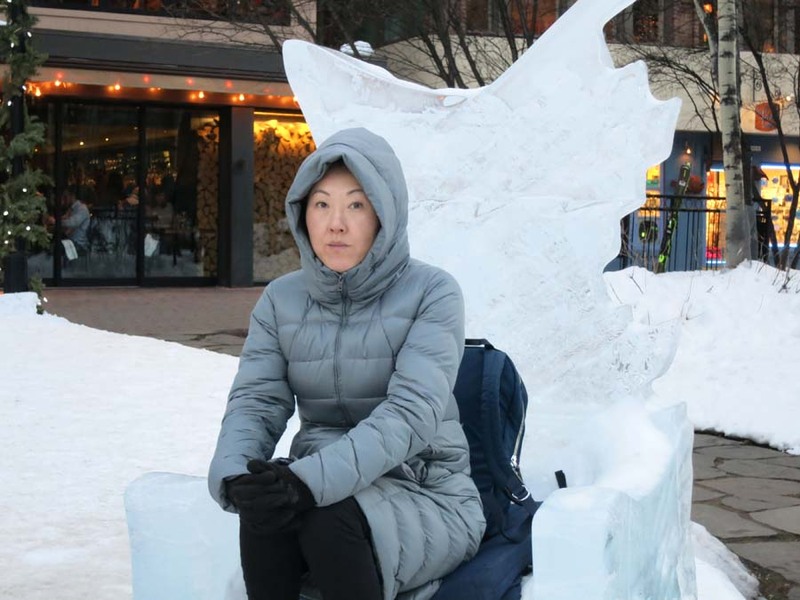 Another picture of Katherine in the half melted sculpture. The next day I went skiing again. 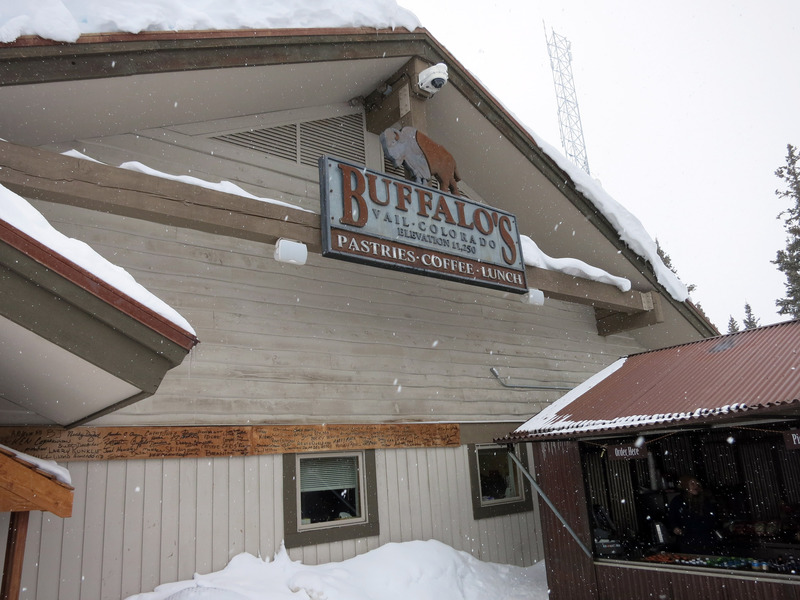 Below is "Buffalo's" small restaurant where I took a short break at 11,250 feet elevation. Yesterday at Two Elk I had a $44 lunch (small pizza and french fries) so today I had a large Mountain Dew soda and a chocolate brownie for $12 for lunch. 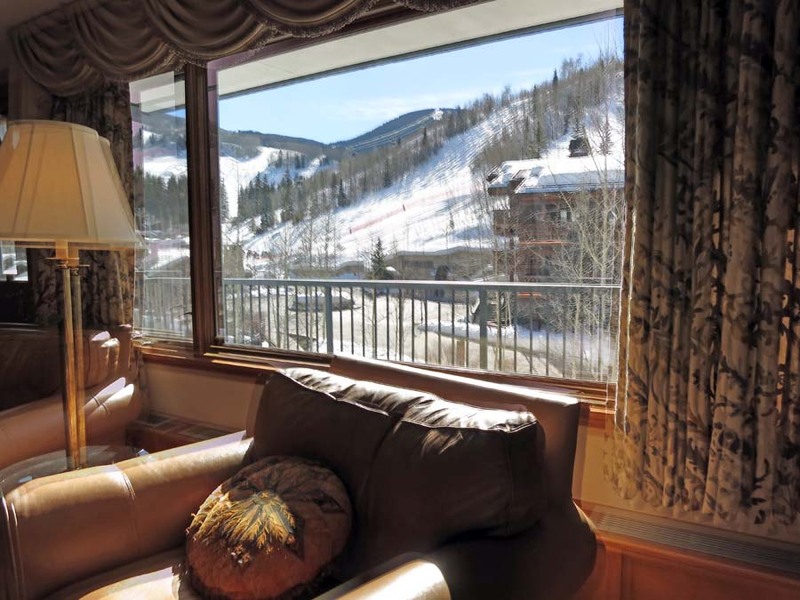 Vail is expensive. Two heroes on their lunch break. 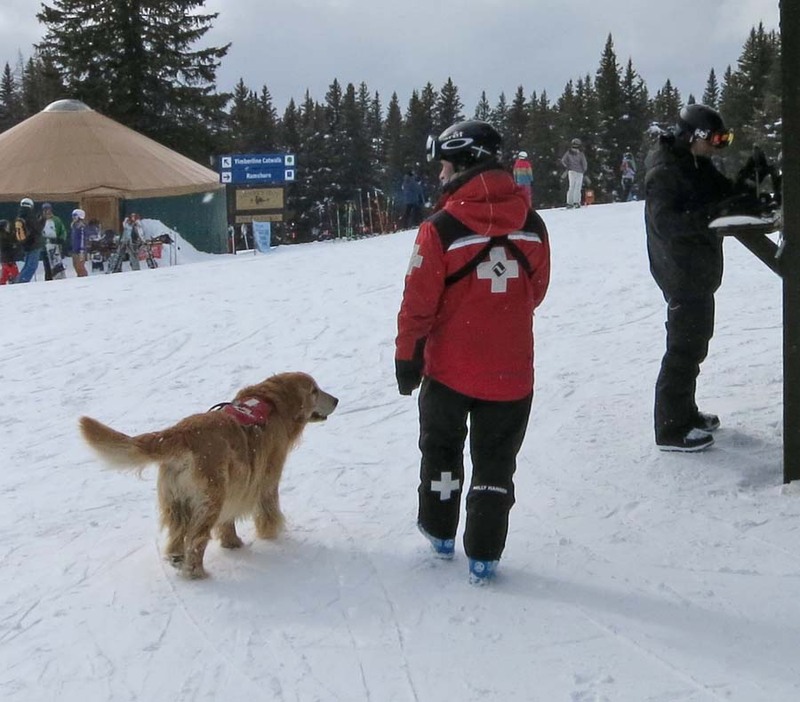 The dog on the left is "Henry the Avalanche Rescue Dog" and I didn't catch the ski patrolman's name. 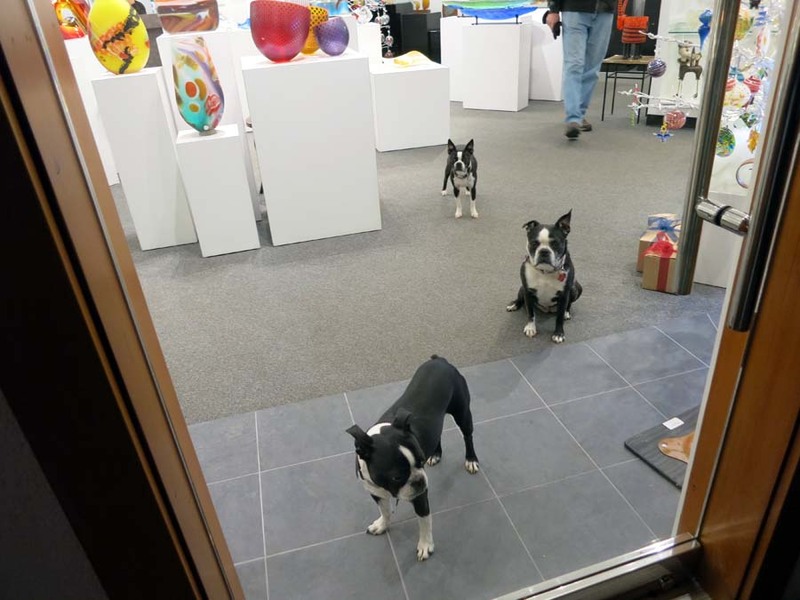 Click Here for a movie about Vail's rescue dogs (not my movie). The ski patrol and dogs train continuously because when somebody gets caught in an avalanche they only have a few minutes to try to save their lives. Under the snow most people can survive for 10 minutes. After 30 minutes half of the people are dead, and after 45 minutes pretty much everybody is dead. 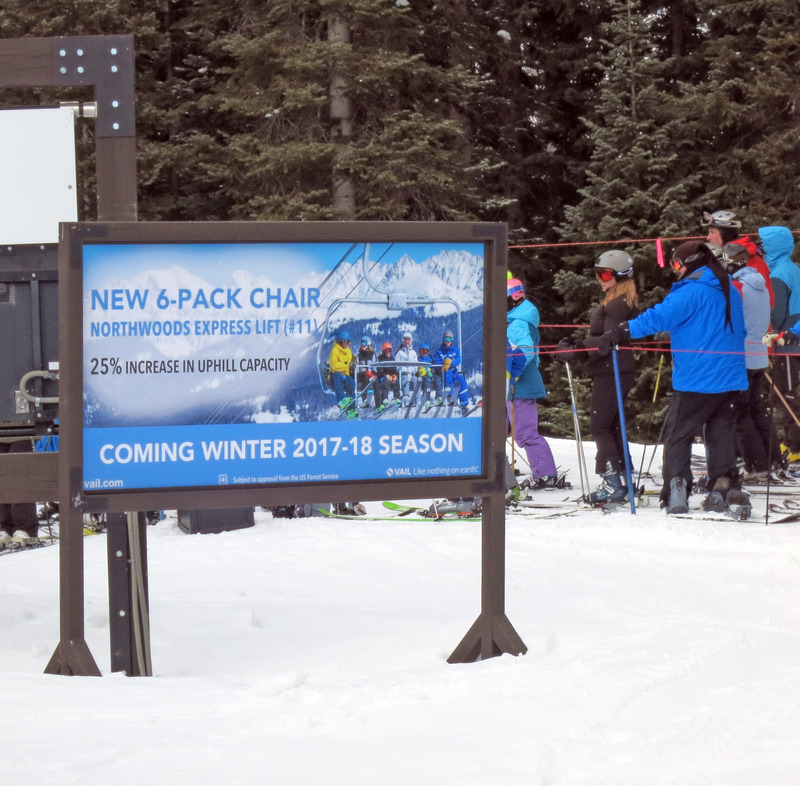 Ski patrolmen make about $10/hour (which works out to $20,000 / year which is below the poverty line). The dog isn't even paid (other than kibble and getting petted). 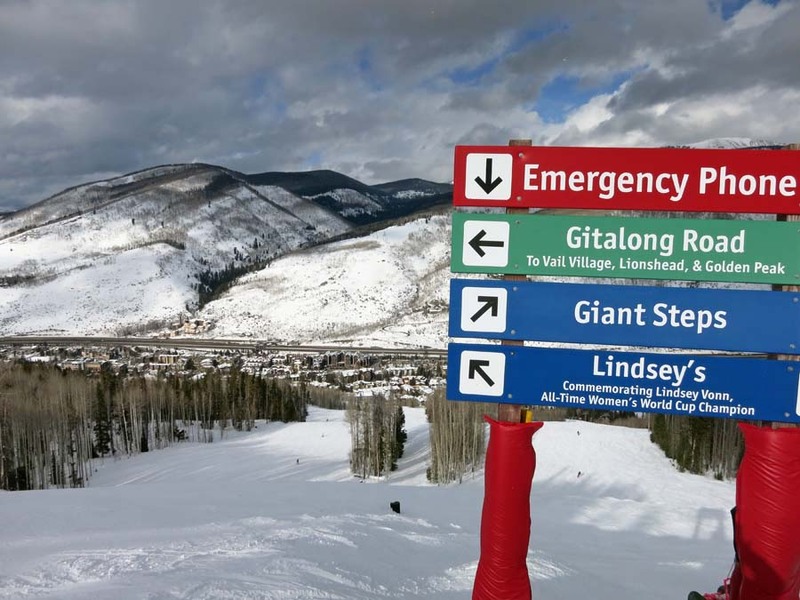 Combined with the fact that the ski patrol men and women run/ski into avalanche zones every day (plus bomb the snow with explosives before it opens to the public in the morning to make it safe) so they have a high "on the job" fatality rate, it isn't a job for the faint of heart. 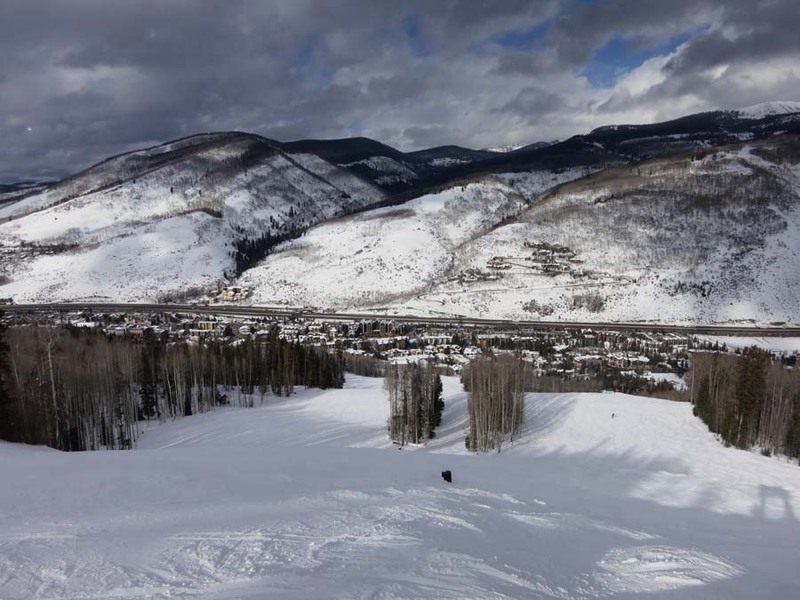 In the after noon of the second day I venture into the famous "Back Bowls of Vail". 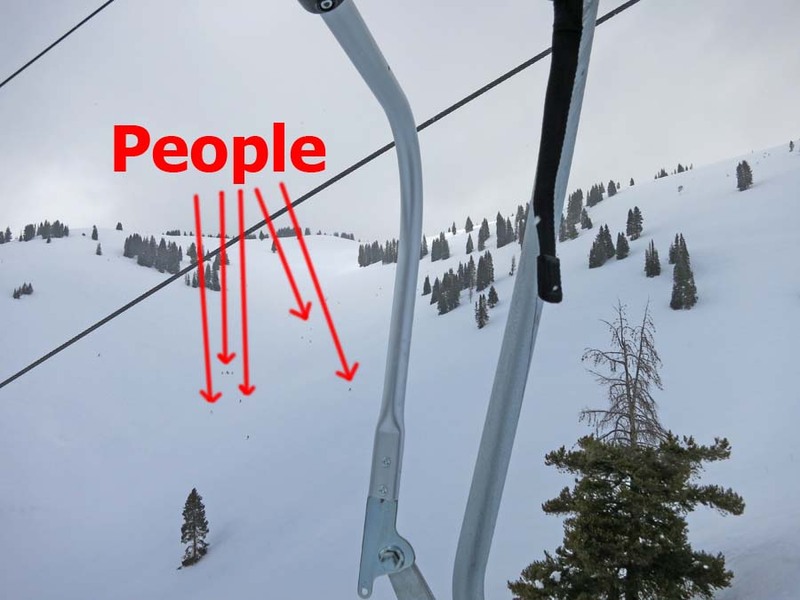 Below I'm on the lift and you can see the big wide open bowls and some people skiing. Click on the picture below to zoom in and see the people. 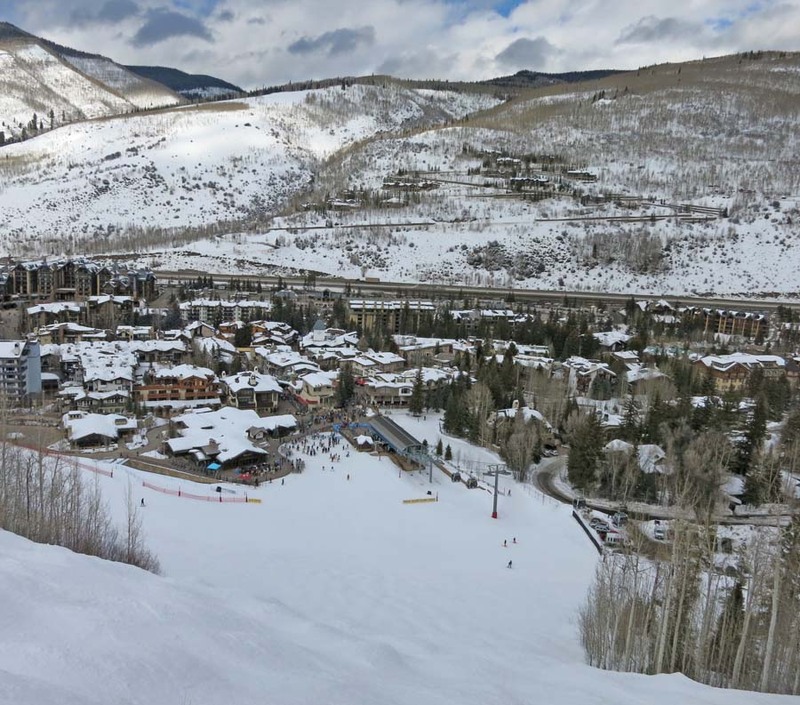 Vail had more high speed quad (4 person) ski lifts before other resorts, and is now upgrading more and more lifts to high speed 6 packs (6 person chair lifts). These really scoop up people and move them up the hill and keep the lift lines down. 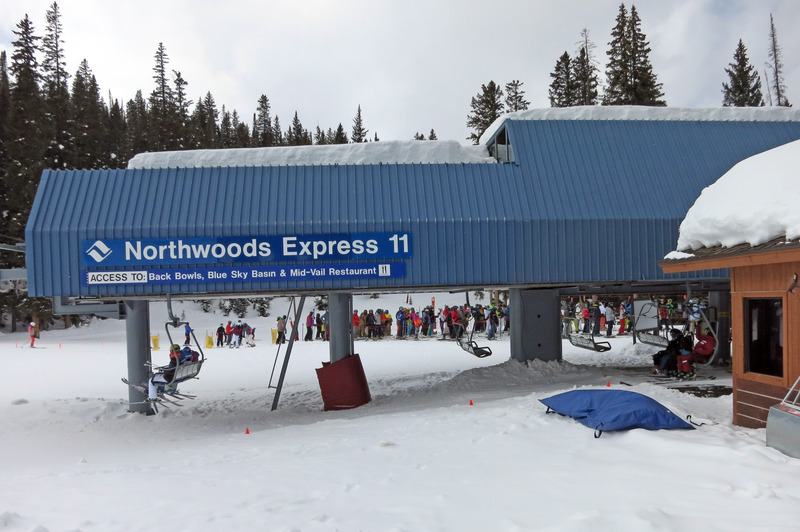 A picture of the bottom of Northwoods Express 11. A random artsy picture of a sign and the town of Vail. Threatening storm weather over Vail Village. My final ski run at Vail down to the bottom of Gondola One. We have to wait 20 minutes for our reservation at Pepi's (see below) so we find this little balcony in a German/Austrian bar/restaurant overlooking the square and watch some people. 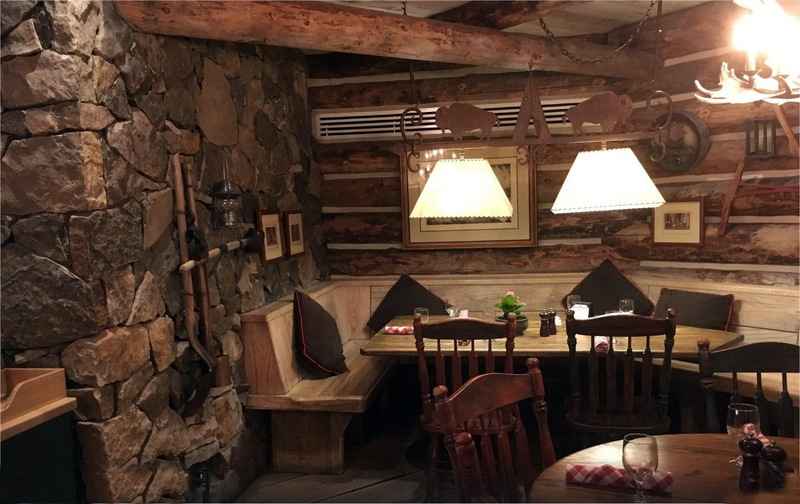 The restaurant is called "Almresi". That's Katherine below. 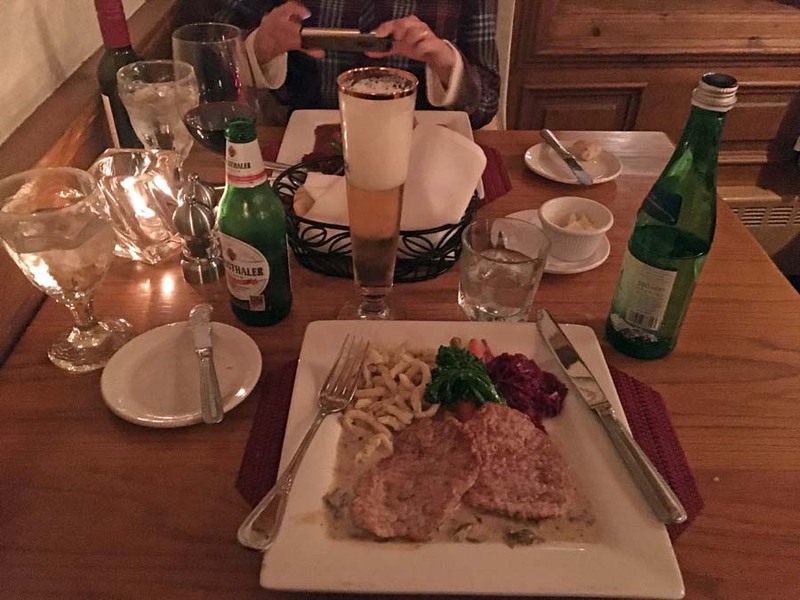 We ate at Pepi's Schnitzel that night, which is a tradition (for me) at Vail. 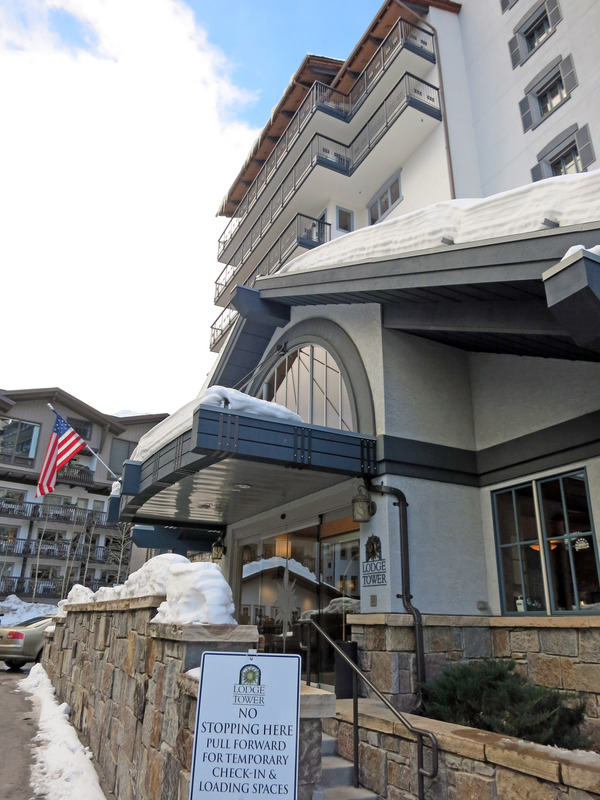 Pepi's is part of Hotel Gasthof Gramshammer in Vail Colorado. 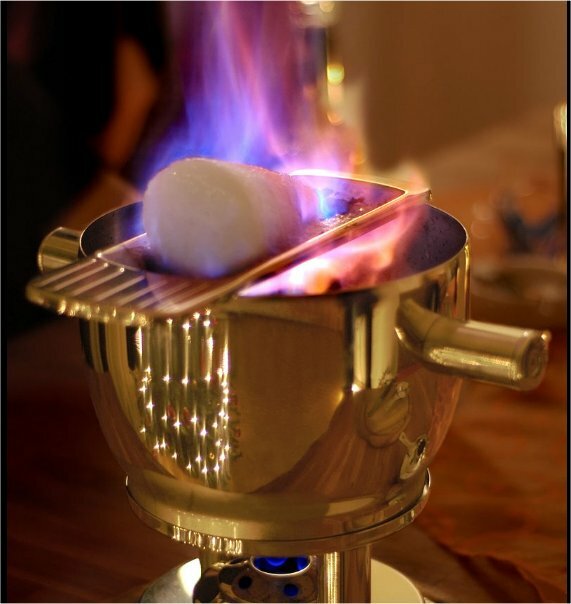 Here is a picture of the front of the menu. 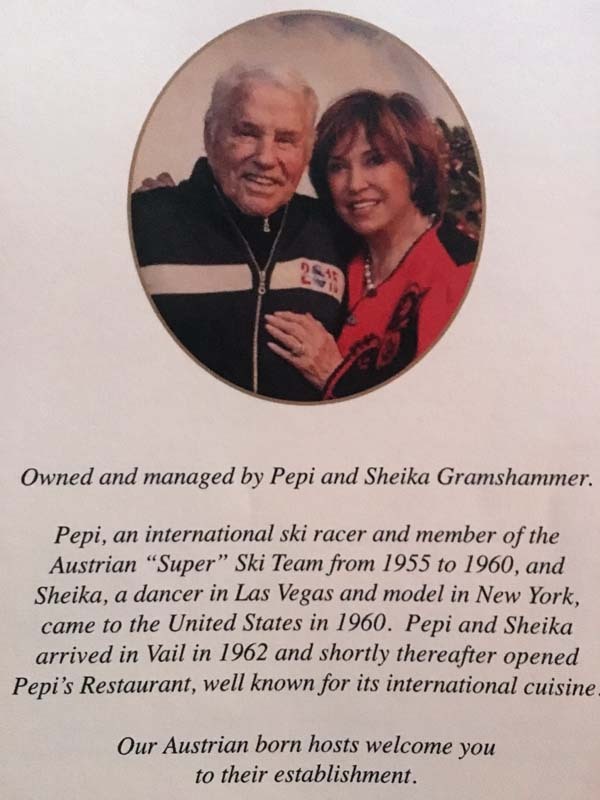 Click here for Wiki Page on Pepi Gramshammer. The rest of this web page is boring, you might want to skip it. 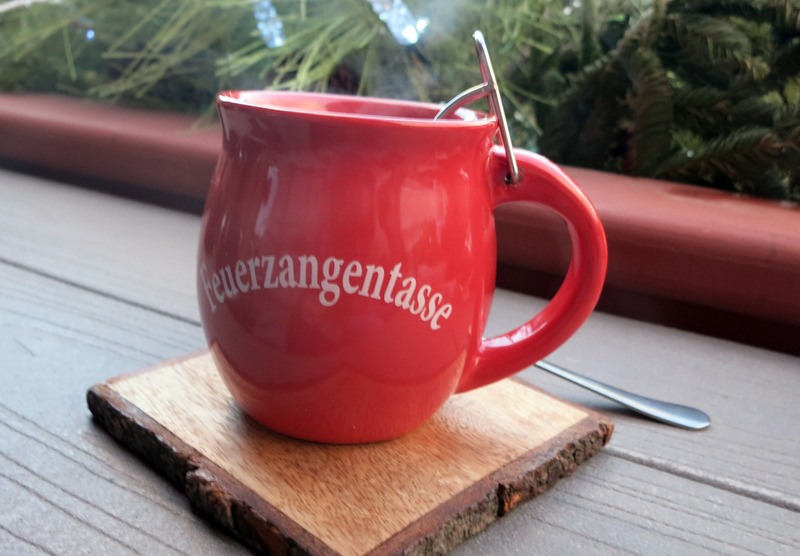 Just documenting various silly things. For example, we stayed in the "Lodge Tower at Vail" seen below. Our room was 387 and it was a "one bedroom condo". 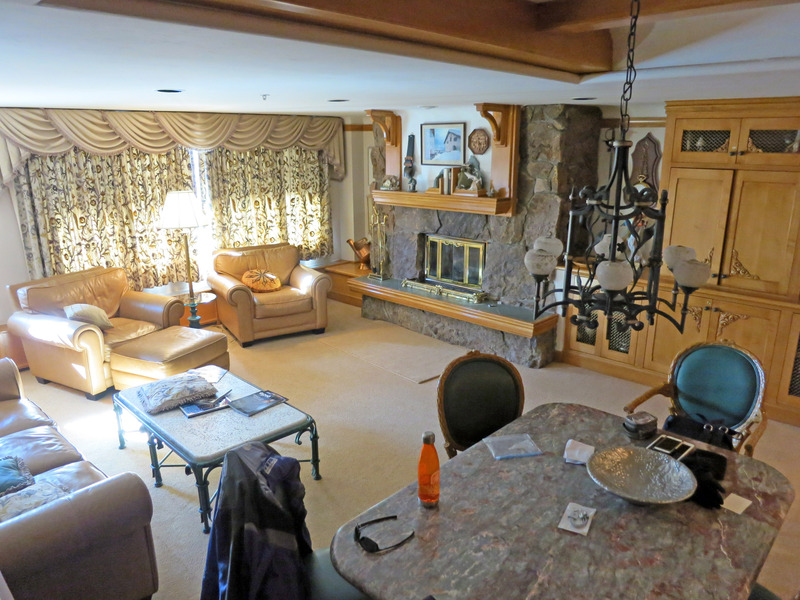 This is a panorama of the main room (all except the bedroom). 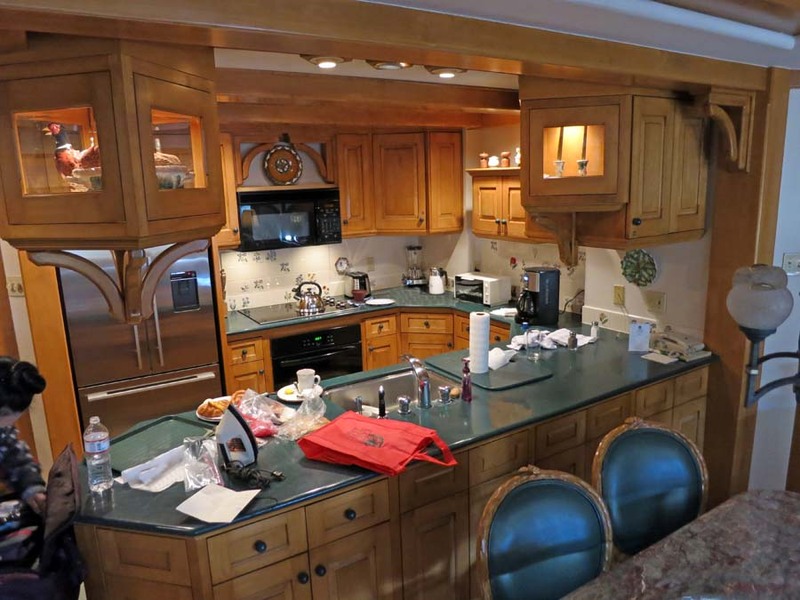 On the far right (use your scrollbar) is the kitchen. Below is the main living room with the front window drapes drawn just so the picture can be made clear (not washed out). 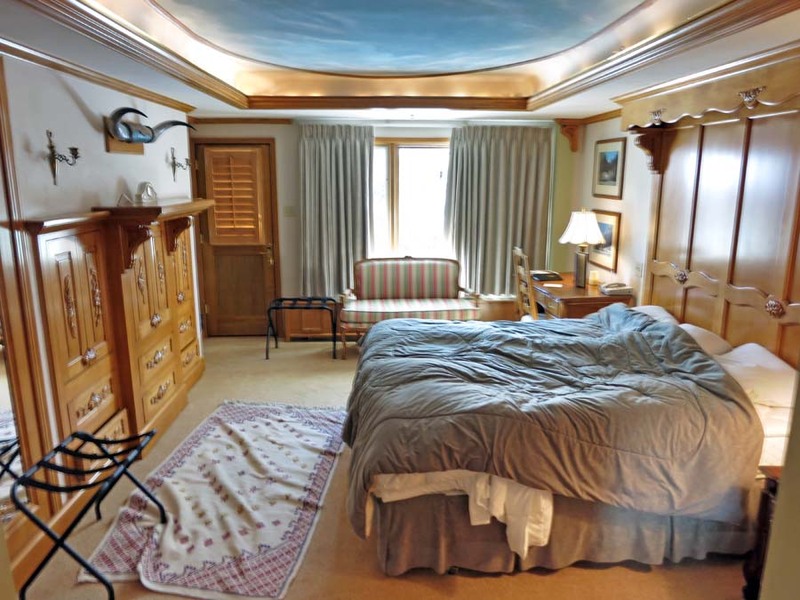 Obviously everything is in really nice condition (this condo costs more than $1,000 per night once you include taxes and fees). The kitchen is at the side of the main room, and is very nice (if a bit small). It had a couple of coffee makers but no coffee or filters were pre-stocked so remember to bring your own (there is no where to shop anywhere in Vail). For $1,000 per night I wouldn't have minded an option to pay them ANOTHER $50 per day and get coffee and filters pre stocked. Below is the bedroom. It was nice and spacious. The shower looks nice, but the faucets were barely attached and had troubles operating and setting the temperature, and it is a "children's tub" not a walk in shower for adults. It works fine. The water pressure was AMAZING so that was nice. 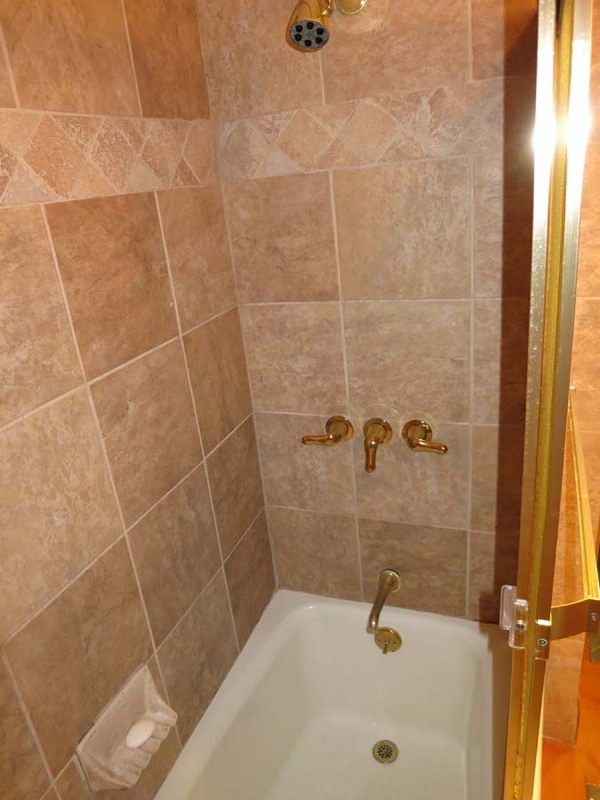 There was some rotten boards outside the shower all discolored with mildew from a leak in the shower, and some of the tile work around the toilet needed to be repaired, but overall it was "upgraded" and fairly nice, just small. 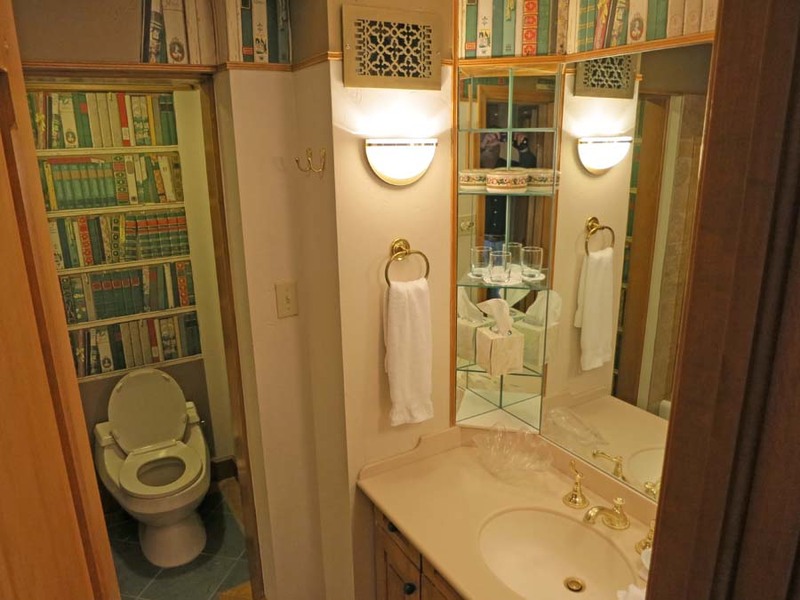 OH -> in addition, there was no bathroom "fan". Katherine setoff the fire alarms because so much steam built up in the bathroom that leaked into the bedroom. When the hotel staff showed up, they asked "a lot of steam in the bathroom? Yep." It sounds like this is an ongoing problem they have no solution for. They should seriously consider putting in a bathroom fan into the bathroom like every other bathroom on earth has. The next morning I took the picture below as we left Vail. 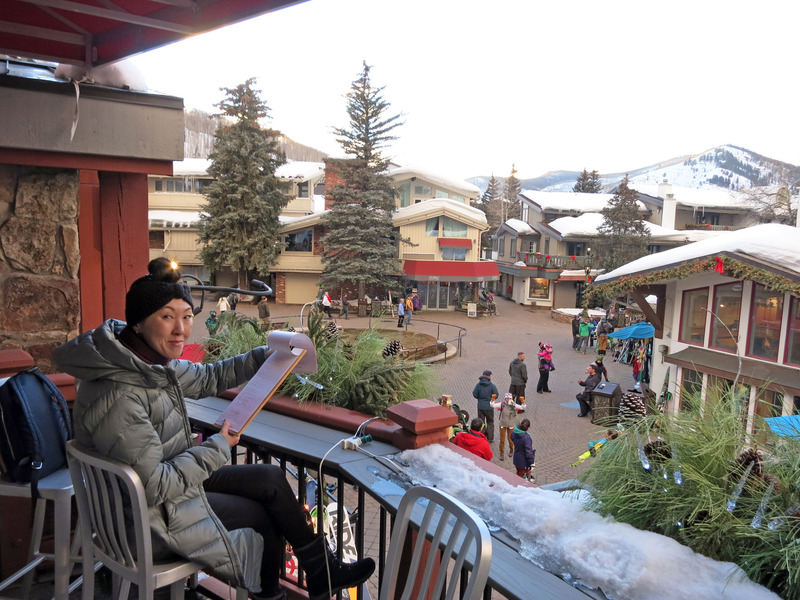 Bye bye Vail, hope to get back in a few years! 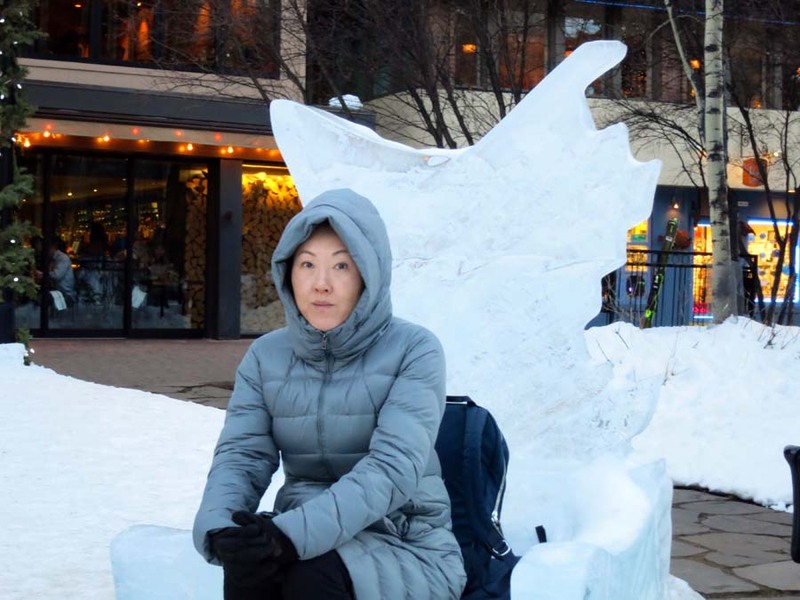 30 days in advance - check Passport (foreign country only) - also, am I buying new fat skis or maybe renting there?